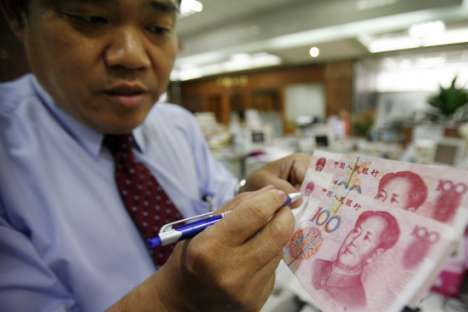 Recent media reports suggest that Beijing is considering backing the yuan with gold. This decision, if taken, will likely affect China's economy and may trigger a new wave of the global economic crisis. For Russia, however, such a scenario may have its benefits. According to media reports of early July, the People's Bank of China is mulling the possibility of phasing out the dollar as the reference currency for the yuan exchange rate, and to start using gold as the reference point. The reports have not been confirmed officially, but analysts are warning that the step, if taken, will weaken the yuan and destabilise China's already troubled economy, ultimately provoking a new bout of the economic crisis worldwide. Beijing's possible move to back the yuan with gold would not be meant as a strategic measure to strengthen the national currency and increase its attractiveness as an investment medium. Rather, it would be a flaunt aimed at demonstrating to the world (and to the USA in particular) that China is capable of taking the risks associated with a departure from the dollar standard. Experts warn however that, apart from benefiting no-one, such a decision may actually have catastrophic consequences. Separating the yuan exchange rate from the US dollar may further weaken the American currency in the long run; in addition, China's monetary policy would become very much restricted, believes Evgeny Nadorshin, chief economist at AFK Sistema. "The yuan will start fluctuating severely against the dollar and other major reserve currencies. This will affect the Chinese economy, which currently has serious problems as it is: the export revenues are falling, and the statistics for freight traffic and electricity consumption indicate a significant slowdown in business activity," says Aleksandr Golovtsov, head of the research department at UralSib Asset Management. Given the current economic recession in China, backing the yuan with gold may further worsen the situation. In essence, China is running the risk of launching a new wave of the global economic crisis, experts concur. When it comes to discussing possible consequences for Russia however, opinions differ. Aleksandr Osin, chief economist at Finam Management, actually believes Moscow could benefit from a gold-backed yuan because this would help Russia in its economic relations with China. On the other hand, the greatest danger to Russia being highlighted by most experts would be an increase in competition from Chinese commodities, which will be offered more aggressively in the export market due to the shrinking of domestic demand. "China's demand for Russian raw materials, in particular for crude oil, metals and fertilisers, will be growing at a slower pace [than is currently the case]," Golovtsov notes. "What is not clear in all this sttory is why China should back the yuan with gold in the first place," muses Natalia Orlova, chief economist at Alfa Bank. "Beijing could simply divorce its currency's exchange rate from the dollar without locking itself into dependence on the price of gold and the amount of that metal in the country." Russian financial experts are cautious about the possibility of the yuan becoming a popular investment medium; they are not prepared to recommend keeping one's savings in yuans just yet. "For yuan to become an investment medium there must be fewer restrictions on currency circulation and a greater freedom of foreign operations with that currency," Nadorshin points out.